It would be a wonderful world today if there were cures for all cancers including skin cancer. 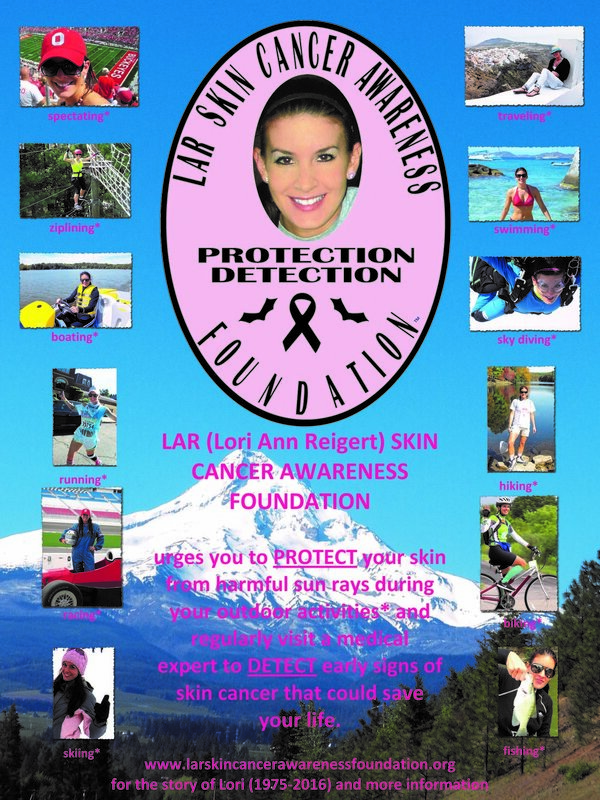 Until that time comes, avoiding skin cancer by protecting your skin and detecting skin cancer early should be a top priority for everyone and that is the mission of this foundation. The foundation promotes cautious exposure to the sun by protecting your skin from the sun’s rays by using and correctly applying the appropriate sun screen for you and your outdoor activity. Exposure can also be improved by wearing protective clothing, including hats and sunglasses, whenever possible. Along with careful skin care, the foundation supports timely skin exams by the appropriate medical experts in order to detect early signs of cancer for a better chance of successful treatment. The foundation believes that the PROTECT and DETECT approach to skin cancer as a normal and routine part of one’s life will reduce the incidents of the disease and save lives. However, sometimes the disease cannot be stopped.......Lori Ann Reigert was very conscientious about her sun exposure and her skin exams, but her disease hid inside her body without symptoms before it took her life. She was a very caring person and hopes that her foundation will raise awareness along with educating young and old about protection and early detection of this deadly disease. Provide financial support and sponsorship to appropriate cancer related events, activities and organizations to assist them in meeting their goals and to promote the mission of the LARSCAF. Offer products and services to the public that encourage and meet the goals of the LARSCAF. Provide promotional items that raise awareness of our mission. *The “little bats” in the logo represent her very favorite holiday of the year, Halloween. Click the icon above for Protection and Detection information.